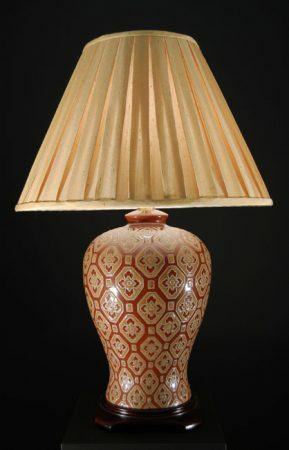 This hand-painted classic ceramic ginger jar table lamp features a dark wood base, bronze glaze and supplied with a fully lined champagne box pleated lamp shade. Finished to an exceptional designer standard, this beautiful ceramic lamp has a rich warm tone which will transform a normal light into a rich mellow glow. Height to lamp holder 17 inches – Height of shade 11.5 inches. Please contact us if you would like to buy the table lamp base separately. We are interested in 4 of these lamps, are the compatible with a dimmer? As long as you are using dimmable almps and the correct dimmer, then these table lamps can be controlled via a dimmer switch. what’s the width of the shade in the bottom where it´s biggest? The bottom diameter of the shade supplied with this table lamp is 18inches, or 450mm.